SENS is the industry’s leading supplier of genset engine starting chargers and best battery selectors. Engine generator sets (gensets) generate power for a vast array of buildings, industrial facilities,venues, and military sites when utility power is not available. From its inception in the early 1970’s, SENS has continuously served both the mobile and stationary segments of the genset starting market. We engineer and deliver the industry’s most innovative and reliable genset engine start battery chargers and related products. Our quality, on-time delivery, and service are unrivaled in the industry. Working both directly and through our network of specialized manufacturer’s representatives, SENS serves all elements of the genset value chain: Large OEMs, regional OEMS and packagers, genset distributors and dealers, generator service organizations, construction companies, industrial distributors and end users. 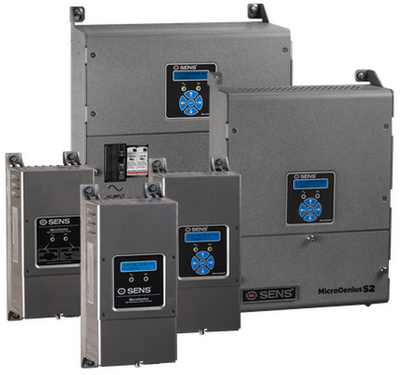 SENS LC and MicroGenius 2 chargers are popular in mobile and rental power units or small stationary installations such as gas stations, hotels, or agricultural operations. NRG and the MicroGenius 2 family of chargers are extensively used for starting backup generators at critical facilities such as hospitals, schools, manufacturing plants, processing facilities, and military installations. SENS IQ chargers and BBS best battery selectors are the de-facto standard for data center generators, where ultra-reliability is critical.